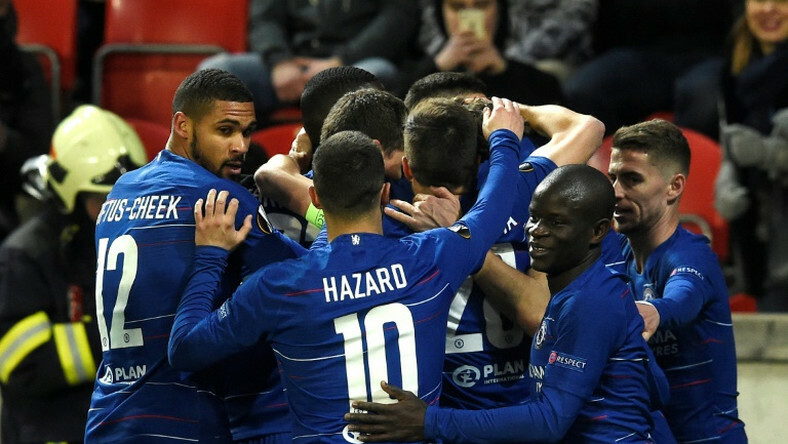 Marcos Alonso’s 86th-minute header gave Chelsea the edge over hard-working Slavia Prague with a 1-0 win in the first leg of their Europa League quarter-final in the Czech capital on Thursday. The Spanish left-back capitalised on a fine cross by Brazilian winger Willian, the tireless mastermind of Chelsea’s attack on a chilly night. Willian himself came close to scoring on 25 minutes but slammed his right-footed effort onto the crossbar. Maurizio Sarri made seven changes from Monday’s 2-0 Premier League win over West Ham, and Chelsea took some time to warm up. Those left on the bench included Eden Hazard, who is being touted as a possible £100 million (116 million euros, $131 million) summer transfer target for Real Madrid. Slavia had the first scoring chance but captain Simon Deli narrowly missed with a diving header from Miroslav Stoch’s free-kick two minutes into the game. The Czech top-flight leaders had a rare shot on goal in the first half as Petr Sevcik saw his long-range strike stopped by away goalkeeper Kepa Arrizabalaga. When Chelsea, who won the Europa League in 2012/13, managed to break the solid Slavia defence, it was through Willian on the left flank, but his ideas found little response from his teammates throughout the opening period. Hazard came on in the 59th minute and breathed life into Chelsea. But German centre-back Antonio Rudiger saw his shot saved by Slavia keeper Ondrej Kolar and then headed wide, while Willian missed with a low shot. Slavia kept Arrizabalaga busy shortly before conceding the only goal, as the Spanish ‘keeper stopped Ibrahim Traore’s blast before diving to parry away Jan Boril’s acrobatic left-footed attempt. Owned by Chinese developer Sinobo, Slavia missed around 2,000 fans banned from the stadium by UEFA over misconduct during their last-32 game against Genk.